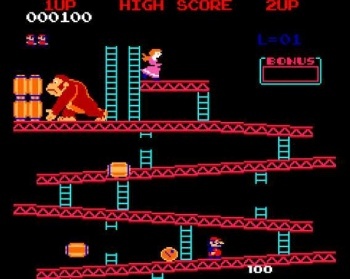 An elaborate plan to transform a student center at Columbia University into a Donkey Kong level has been cancelled after the pranksters lost their nerve. "Project Miyamoto" was a prank so grand that it required hundreds of dollars worth of materials, money that the project's masterminds turned to the internet to try and raise. But just days after the call went out for donations, the project has been cancelled over concerns that it couldn't be pulled off safely. A message sent out by "AronSora" - the student that originally had the idea - to those who had pledged money said that the plan was getting too risky and he was calling it off. He added that he was worried that rolling barrels down the building's glass ramps would damage them, and the person dressed as Donkey Kong would hurt himself lifting the barrels over his head. He thanked everyone for supporting the project and for reminding him how "amazing teh intertubes are." The site used to gather the donations doesn't take any money until the funding target is reached - which the project didn't manage - so no one is going to be out of pocket and no one will have to wait for a refund. AronSora said that the prank might be revisited in the future, but that right now, he couldn't pull it off in a safe, non-damaging and most importantly, stealthy way.